In order to reach our goal of bringing mathematics closer into society, THALES + FRIENDS began, in 2005, to promote and support reading groups, both school-based and independent, with a strong emphasis on mathematics-based literature. In the intervening years, our reading groups began to embrace all kinds of thought-provoking books, both fiction and non-fiction. 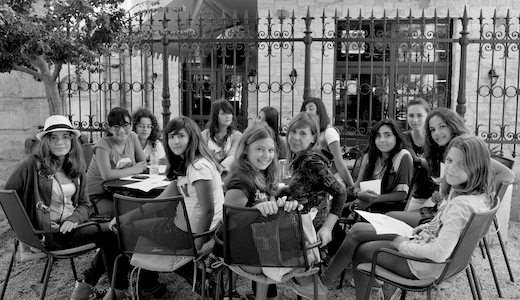 THALES + FRIENDS-organized reading groups operate all across Greece, from the far flung islands to Thrace to Athens. Most of our groups are run as extra-curricular activities at school, led by dedicated teachers, and attended by some of the brightest students in Greece. We also have dozens of adult reading groups in our ranks. To date, THALES + FRIENDS has helped to organize over 350 reading groups, and the number is growing. With the aim of promoting reflection and dialogue about and beyond the sciences, THALES + FRIENDS organizes frequent lectures, seminars, and meetings in Greece. If you would like to know more about our operation within Greece, please don’t hesitate to get in touch with us via the Contact Us link. Greek-speakers who are interested in finding out more about THALES + FRIENDS are encouraged to visit our Greek website.